In a modern world where recycling and global warming are a part of every dinner conversation around the globe, recycled glass countertops are becoming increasingly more popular. Recycled glass countertops are also less expensive than marble, granite or quartz countertops. There are no shortcomings with this type of countertop and the advantages balance out the affordable price. Recycled glass countertops are manufactured with porcelain and recycled glass to create a low maintenance, gorgeous countertop. Some countertops are made with cement instead of porcelain called IceStone products. Both of these are truly fantastic options as they are both highly durable, heat resistant and do not absorb any type of liquids. Natural stone countertops such as granite absorb liquids and are especially sensitive to fruit juices. Recycled glass countertops made with either cement or porcelain provides these qualities and are both enormously durable. One of the disadvantages to installing natural stone countertops is that due to the difficulty handling these natural products, backsplashes often have to be left out. This is not the case with recycled glass countertops because they can be installed virtually anywhere including bathrooms and floors. Recycled glass countertops go the extra mile by being conscious of the environment as well as providing a stunning look to any kitchen or bathroom. Every individual that has created a kitchen or bathroom knows how imperative color and pattern scheme are in these rooms. The recycled glass countertop is not only durable and environmentally friendly but also provides an excellent array of colors. Most people who choose to install recycled glass countertops can create custom colors to suit the individual room. For the sake of comparison, many who inquire about recycled glass countertops also want to compare to natural stone countertops such as granite. Recycled glass countertops are just as durable and sturdy as the granite or other natural stone. As well, there is not the need for sealing and resealing as in maintaining a granite countertop. Concern for the environment subsides greatly with a recycled glass countertop. Just knowing that these glass bottles and containers are not contributing to global warming can be a great relief for many people. From an environmentally responsible standpoint, recycled glass countertops also provide the opportunity to save money by reducing water usage as well as energy. The reason behind this is that recycled glass countertops are very easy to maintain and cleaning does not require harsh chemicals. Recycled glass countertops are very trendy and elegant than any in the past. Recycling glass products for practical use has become main stage in today’s society. The countertops that are made using recycled glass are directly responsible for less volume for the landfills. Most people of today know that glass is not biodegradable and therefore poses a problem many years into the future. They are very flexible with the style of the countertops and are available in more than 20 colors. 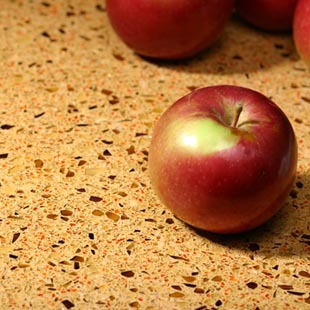 Recycled glass countertops are a very popular trend that is taking the construction and home design community by storm. With the rise of a globally conscious community, these elegant countertops can be custom designed and ordered to benefit virtually any color scheme. Not only is sustainable energy a rapidly raising debate, sustainable design is also up and coming. There is very little negative impact on the environment as well as giving a sanitary food surface. Going Green is the way of the future and the manufacturers of recycled glass countertops have revolutionized the glass recycling industry. There are very few disadvantages to installing recycled glass countertops into the home. In fact, this trend has just started to catch on and many people are gravitating towards purchasing products that will help conserve energy. In fact, the Leadership in Energy and Environmental Design (LEED) has stamped their seal of approval on such countertops and flooring that is manufactured using recycled glass. Although it was originally designed to oversee commercial buildings, it has recently adopted a residential program as well. Recycled glass countertops seem to be the wave of the future; hop on the wave and enjoy the wild ride that recycled glass can bring to your home. Kitchen Countertops - Quartz, Cambria, Recyled Glass and other unique finishes.